Use the links below to browse hundreds of free quilt and quilt block patterns, all with detailed instructions and illustrations. You'll find easy quilt patterns and projects that are more advanced. Don't hesitate to try any pattern, even if it seems a bit complicated. The instructions lead you through quilt construction in a step-by-step manner and always include links to tutorials that can help you understand the specific skills required to make each quilt. Project sizes in this selection range from crib quilt patterns to quilts that are somewhat larger, and are suitable for toddlers, too. Many of the baby quilt patterns are very easy and designed for people who want to make a quilt for a special little one but aren't sure they want to continue quilting. All of the patterns in this index are easy, so it's a good destination for beginning quilters. If a pattern seems a bit more advanced, take it slowly and proceed one step at a time... you'll do a great job. This link is the jumping off point for all larger quilt patterns. Patterns are illustrated in gallery format to help you preview the projects. Browse the images until you find projects that are just right. Rag quilts are quick and easy to make, and oh so cuddly. Use flannel for batting and you won't even need to add quilting stitches unless you'd like to dress-up the quilt just a bit. Flannel offers a few more pluses... it creates lush frays and adds warmth to a project. You do need to unlearn the typical process for sewing patchwork together, but the change is a cinch. 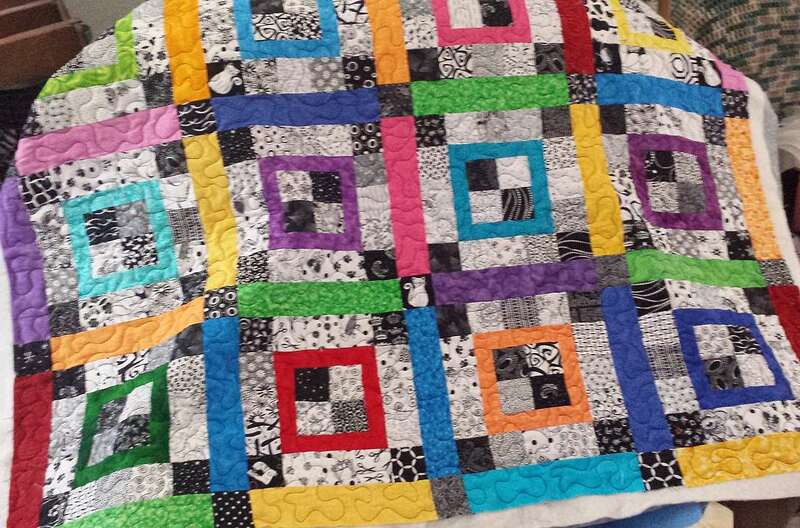 And once you've made one rag quilt, the rest are a breeze. Blocks in the galleries below are arranged alphabetically.You'll find patchwork quilt block patterns, string quilt blocks, appliqué designs, paper pieced projects and blocks made using other techniques. Sizes range from miniature to very large and often include multiple size choices. The quilts in this group aren't quite large enough to fit on most beds but aren't strictly for hanging on a wall, either. Some are perfect for lap quilts, to use as a picnic blanket for summer outings, or to keep stashed in the car for cold weather emergencies. Many are just the right size for baby quilts. We often refer to this technique as 'paper' piecing, but that's just one method used to refer to the broader topic of foundation piecing. The little Oddfellows Star shown here is a miniature, and the technique is a good choice for small quilts. Like rag quilting, once you understand how paper piecing works, no pattern will be a problem. Miniatures don't all have to be super tiny, so I've tried to cover a range of pattern sizes, from 1:12 dollhouse quilts to wallhangings that are sewn to a small scale, but aren't quite as challenging. Try a small quilt for a doll bed or to use as decor throughout the house. My easy pillowcase pattern with French seams is one of the projects in this index. You'll find others, too, including a zipper-free throw pillow cover made from UFO quilt blocks, a purse made from a denim skirt, an easy eye pillow pattern and more. Even a tutorial that explains how to fold and cut a true snowflake. While any quilt can be re-themed to make it suitable for the holidays, all of these projects are Christmas designs. The easy Christmas Stocking quilt block shown here is one project and two sizes are included. Projects include Christmas tree quilts and quilt blocks, table runners and other quilts that are perfect for the holiday season.